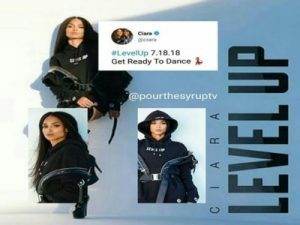 “Level Up” is Ciara’s first official single from her seventh – yet untitled – studio album, released on July 18, 2018 via Beauty Entertainment. The song is an uptempo self love anthem about realising your worth and stepping up you game. The title of the song is a reference to the controversial instagram post Ciara shared months ago. The post is a 2016 clip showing John Gray’s sermon in which he speaks to women about what they can do to find a husband. The post was accompanied by the hashtag ‘’#LevelUp. Don’t Settle’‘ and sparked thousands of reactions either supporting or condemning Ciara’s approach towards women.